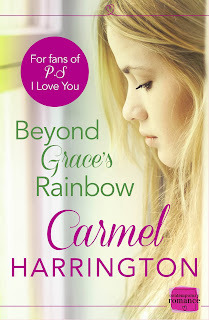 Today I'm pleased to be taking part in the blog tour for Beyond Grace's Rainbow with a Q&A with the author, Carmel Harrington. Can you tell us about your book? Beyond Graces Rainbow tells the story of a young single mother, Grace Devlin who finds out that she has cancer. She needs a bone marrow transplant from a family member, but as she is adopted this means that she must find out who her biological family is, which is a secret that has been veiled in secrecy for over 30 years. To make matters more complicated, Liam, Graces ex-boyfriend and father to her son, is back in town and is determined to prove that he is worth a second chance. But can Grace dare to love again, especially now as she faces the biggest fight of her life? It is an extremely emotive story that will make you both laugh and cry in equal measures. What was your inspiration for Beyond Grace's Rainbow? The idea to explore what it would be like to be very sick and need the help of an unknown biological family actually came to me following a conversation with my best friend, who is adopted herself. We were chatting about how hard it is for adopted people to not know their family medical history, when they have not managed to trace their biological parents. So I decided to make Grace adopted who is suddenly faced with a double whammy – firstly she has cancer and secondly she needs to make a brave decision to start looking for her unknown parents. What has been your greatest experience of being a published writer? I have had quite a few over the past few weeks since HarperImpulse announced that I was joining their team, I’m not sure I could pick just one! Seeing the new book cover, working with such a team of professionals in HarperImpulse, reading all about my book in newspapers and the radio and tv interviews. It’s all been so much fun. But what I can tell you is that it has been everything and more than I ever could have imagined. Keep believing in yourself, especially in those moments that are darkest. It is a tough industry to break into, but with hard work, determination and the right talent, it will happen for you. Just keep dreaming. What was the first book you ever bought yourself? Oh that is a really good question. Because I can remember the first book I ever borrowed from our library, but I am trying to work out what the first book I ever bought actually was! I am pretty certain it would have been one of Dean Koontz’s novels. I’ve started working on my third book which is actually a sequel to Beyond Graces Rainbow. It takes up the story about a year later and catches up with old friends and also introduces some new ones too. You can find out more about Carmel and her book on her blog, Facebook, Twitter and Goodreads and you can buy the book from Amazon.